Whether you quilt, embroider, sew home decor and garments, or do a combination of everything, this machine makes it all more enjoyable. You'll be able to complete projects more quickly when you're on a deadline. But it’s so effortless to use, and gives you such powerful tools, you can also spend whole days happily stitching, loving what you create. It truly expands your horizons. Only Janome brings you this perfect blend of advanced technology and signature ease-of-use. 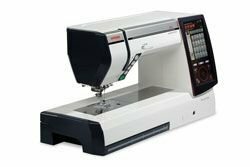 The MC12000 has all the incredible functionality you've hoped for in a sewing and embroidery machine, implemented in ways that are intuitive, smarter, and just plain more enjoyable. Have you noticed how the touch screens on other embroidery machines keep getting larger and larger? Janome engineers examined this phenomenon and came up with a better solution: A machine that not only allows on-screen embroidery editing, but also offers the complete flexibility of a computer interface and the delicate control of a mouse. The memory craft 12000 gives you a touch screen that is certainly large enough to do onscreen editing. But if you want a view that's much larger than any sewing screen can offer, connect the machine to your PC via exclusive Horizon Link. Now you can create and edit embroidery designs and stitch combinations on your computer with the mouse - anywhere anytime. Perform editing functions on your laptop, desktop PC or Windows tablet with a screen as large as you like. There's no need to transfer your layout to the sewing machine, because when connected, Horizon Link is making your changes in real time; you can see it happening right on the machines screen. And because the Horizon Link software installs on your computer, you can also create layouts on the go, then re-connect and sync to your Memory Craft 12000 when you're back to your sewing room. Now you can use the new JPX file format for embroidery designs. 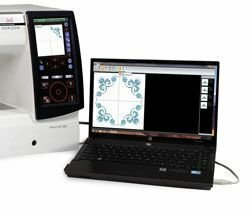 It allows the Memory Craft 12000 to view graphic data, which you can then use to fine-tune your designs when embroidering iron on transfers. You can create JPX files in digitizer MBX and send them to the machine via Horizon Link. The unique Stitch Composer program allows you to create and edit stitches from your computer. 30 stitches from the machine are built into the program, for a truly customized experience, design your own original decorative stitches from scratch. The stitch composer software with Horizon link turns your PC into a powerful stitch editing tool. You can modify one of the dozens of stitches in the stitch composer library, and save it as a new stitch. Or, create your own unique stitch with an easy, dot-to-dot type of drawing tool. Begin and end with a lock stitch. Mirror your patterns horizontally or vertically, even specify the needle position. You've never had so much control over your machines stitches or so much creative freedom to develop your individual style. Our AcuFeed Layered Fabric Feeding System has long been legendary in the sewing and quilting world for its amazing precision and power. With the Horizon Memory Craft 12000, we've found a way to improve on this amazing device. Now, the AcuFeed system is removable - when not in use, simply store it in one of the ample accessory trays. Adding and removing is easy! AcuFeed now comes in two useful options. The two-pronged AcuFeed feet advance fabric flawlessly from the top and bottom. 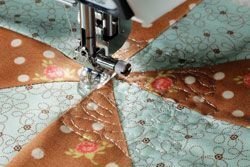 Use this system for quilting, seaming, and traditional sewing. Our special one-pronged AcuFeed feet give precise control for more detailed work, like installing zippers and matching seams. It's our largest bed space ever. Perfect for quilting, home decoration, or any project where added space is a must. But it also means that the machine can accommodate a larger hoop, with all of the stability and precision that Janome is known for! Not only does the Memory Craft 12000 have any more workspace than any other Janome, the sewing bed features a 15 inch stainless steel plate embossed with useful measurements. 11 Inches to the right of the needle gives you plenty of room for your biggest projects. 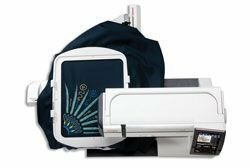 It slips neatly onto the back of the machine to give you a bigger embroidery area than ever before, with even greater accuracy. So discrete and sleek, you can leave it attached for regular sewing. So cleverly engineered, it's the only home use sewing machine to allow free arm embroidery: a Janome exclusive. Janome engineering allows the Memory Craft to embroider up to 1000 stitches per minute. And because the compact embroidery unit is so stable, you can stitch at this speed with hoops up to 9.1 inch x 11.8 inch without losing any Janome stitch quality. 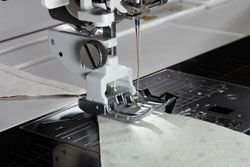 The auto presser foot lift automatically lifts the presser foot after a thread cut - when the thread snip button is pressed, or after a programmed thread cut at the end of a row of decorative stitches - allowing you to keep your hands on your project at all times. It can also be set to raise at the end of any seam, with the needle in the down position for easy pivoting. 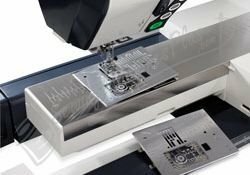 This great feature simplifies the sewing process - you have less manual steps to save time and increase efficiency. That's right - you can create 9mm wide stitches on the Horizon Memory Craft 12000! The extra width makes all of your decorative stitches bolder, brighter, and more distinct. Wider, more distinct stitches allow you to fill more area with stitching, quicker - saving you valuable time while sewing. Most of the 425 built-in stitches take full advantage of the 9mm width. You get twenty feet, newly designed for a 9mm stitch width, included with your machine. In addition to lighting your work area with 10 built-in LEDs in five locations, you can also extend the retractable High Light for greater illumination in the area you need most: directly under the needle. And for an even closer view you can attach the new Acuview Magnifier. Precision Stitching, more decorative choices, and automatic features make expressing yourself through FMQ easier than ever. And now, you can also customize the foot height for your project and preference, then save the settings to memory. Or let Auto Pressure Height adjust for you. Using the right tools at the right time is important in sewing. When using lightweight fabrics, or piecing quilts, a straight stitch needle plate makes all the difference. Our One Step Plate Converter allows you to easily switch and use the perfect plate for your project. Simply press a button to release one plate; then snap a new one in place - it takes only seconds, with no screwdrivers required! This system also includes a sensor that will only allow a straight stitch to be sewn when the Straight Stitch Needle Plate is in place, so you never have to worry about breaking a needle! Both needle plates are included as standard accessories. When embroidering or sewing large projects, it is sometimes difficult to keep track of how much bobbin thread is left. The bobbin thread sensor alerts you when your bobbin thread is running low - so you're never caught in the middle of a seam or embroidery color. The Horizon Memory Craft 12000 has an advanced sensor system which allows you to set the level of sensitivity for the alert - customize it for large scale embroidery projects, when you want to make sure you always have plenty of bobbin thread, or small projects with short seams. This feature is also very helpful for sewing with different thread thicknesses. You can increase the sensitivity when using a thick bobbin thread, and lower it for thin threads. Measuring 11.8 inches x 9.1 inches (300 x 230 mm), the GR Hoop could be called the "Grande." It's designed to allow you to stitch out your largest designs with even better precision. The MC12000 comes with dozens of large-scale designs made just for this hoop. But with this much room to work with, you'll find your creativity in making your own embroidery layouts will go beyond anything you've done before. Like the SQ23, the GR Hoop features magnetic clasps for faster, easier hooping. The FA10 Hoop has an elongated shape just 3.9 inches x 1.6 inches (100 x 40mm). This is the perfect size for doing embroidery in tight places like cuffs and sleeves. Because the Free Arm Embroidery Hoop is so small, you can add embellishment to ready-made items without having to take them apart. At 5 ½ inches square (140 x 140 mm) the SQ14 Hoop is just the right size for many embroidery designs. For best results you want your hoop to be close to the size of the design you'll be stitching out so the edges of the hoop support the fabric and keep it from flexing as the needle goes in and out. 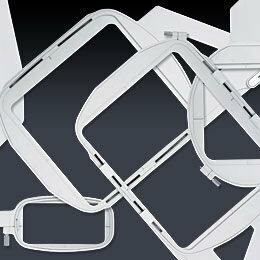 You'll find that this square hoop is ideal for thousands of commercially available embroidery designs. Quilting directly in the hoop is very popular now, and the new SQ23 Hoop is perfectly proportioned for these larger, square designs. At 9.1 inches square (230 x 230 mm), it's ideal for doing embroidery and in-the-hoop stippling on your quilt squares. It also features special magnetic clasps for easier hooping and more precise results as you move from square to square. Horizon Link - It’s easier to create & edit designs in real-time on your computer. You can now use your mouse & laptop keyboard to drag, drop & edit. This means your editing screen can be as large as your computer monitor! AcuFeed Flex - Our popular AcuFeed system is now detachable and comes in two widths ( single & dual prongs ) with multiple feet to address different tasks. Stitch Composer - Create your own stitches with our new Stitch Composer. New Embroidery Unit - A revolutionary slim-line embroidery unit slides onto the back of the machine. It has been designed from our robotic technology to give more precision and higher quality results than ever before. Bigger Embroidery - The Janome Horizon Memory Craft 12000 embroiders designs up to 300mm x 230mm. Bigger Working Area - The total arm length is a massive 440mm ( 17.3” ) , fitted with a 380mm ( 15”) stainless steel plate embossed with useful measurements. There is 280mm ( 11” ) to the right of the needle giving plenty of space for those larger projects. Wider Stitches .... More Choice - The Janome Horizon Memory Craft 12000 will sew most of it’s 400+ stitches .... 9mm wide! Plus there are 338 builtin embroidery designs. 13 automatic one step buttonholes, 3 monogram fonts and 10 embroidery fonts. Auto Presser Foot Lift - There are three ways to lift the presser foot, manually, with the kneelifter and now ....with the touch of a button ! One-Step Needle Conversion - To change from the standard needle plate to the straight stitch one, it’s just one press of a button. 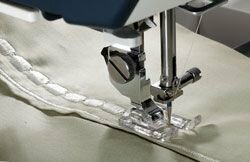 Variable Zigzag - When free motion sewing, you can change from a straight stitch up to a 9mm zigzag, by using the kneelifter. High Speeds And More Precision - Be as precise as you need to be with 91 needle positions. And quality is not compromised even when sewing or embroidering at 1,000 stitches per minute. See It All More Clearly - With 10 built-in LED’s in five locations plus the innovative extendable High Light, sewing has never been brighter. We’ve even added a detachable magnifying glass! 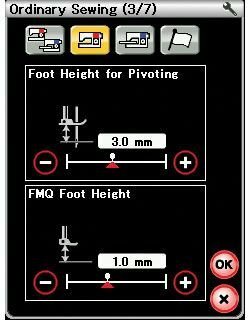 Automatic Fabric Sensor - You can customise the height of the foot and save it in memory or alternatively let Auto Pressure and Auto Height set it for you. Advanced Bobbin Thread Sensor - This allows you to set the sensitivity for the “out of thread” alert. Whats comes with the machine. It slips neatly, discretely onto the back of your machine to give you a bigger embroidery area than ever before, with even greater accuracy. So discreet and sleek, you can leave it attached for regular sewing. So cleverly engineered, it's the only machine to allow Free Arm embroidery: a Janome exclusive. W 22.6" x H 12.4" x D 13.6"
W 22.6" x H 12.4" x D 9"
Work Space: L 11" x H 4.7"
Full Colour LCD Backlit Touchscreen: W 2.7" x H 4.5"